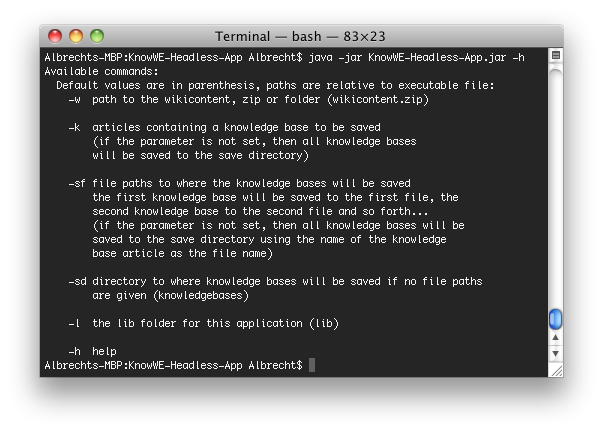 This application generates knowledge bases from a given wiki content folder (or zip file of the folder) extracted from a conventional running KnowWE. The application can be configured via command line arguments and does not itself need a running conventional KnowWE or web service. The knowledge base as a d3web binary file. The wiki content as a zip file. If you double-click the executable file, the application expects a zip file of the wiki content folder with the name wikicontent.zip in the same folder as the executable file. If you double-click the executable, the application will save all knowledge bases compiled in the articles of the wiki content to the folder knowledgebases in the same folder as the executable file. The knowledge bases will have the name of the article they are compiled on as the file name.